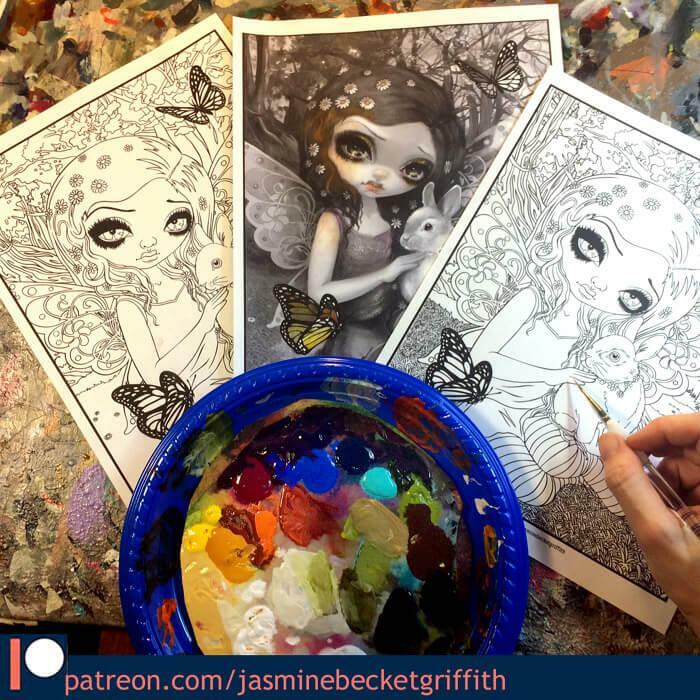 Jasmine in Seattle & California, Free Pins, New Artwork, Perpetual Calendar, ACEOs and more! Firstly – we still have some of the free 20th Anniversary pins for the Strangeling.com giveaway! We’ve already given out nearly half of them, so the sooner you can get an order in – the better (they will probably not last for the full month unfortunately, they are going fast!). We are including a free “Time Flies” pin in each order over $25 placed at Strangeling.com for the month of July (or while supplies last, I made about 200 of the pins). Next up – we are currently on our West Coast summer tour! TONIGHT (July 8) I will be in Seattle for my appearance at the Insectarium group show at Eight and Sand Gallery (part of Georgetown’s Art Atttack art walk) – details are here – I’ll be there from 6-9pm tonight (Saturday) in person, details are here. I have new original paintings (four full sized, two Tiny Treasures), prints and canvases there and I’m happy to autograph anything from the show or what you bring with you from home. July 13, 14 & 15th I will be in Anaheim, California for Disney’s D23 Expo, debuting my new “Princess Aurora” painting for Disney! Details about the specific signing/autograph events & painting debut are here. We return July 17 from the west coast, so in the meantime if you place an order for an original painting or for a limited edition hand embellished canvas in the next week or two we will have a short delay (as I have to wait until I’m back in my studio to ship those personally!) – everything else though (prints, pins, books, etc.) will be shipping as always with no delay. Next – I have a new painting to show you! The piece I did for the Three Wishes Faery Festival is now available as prints & canvases (the original painting has been SOLD). You can order those here at Strangeling.com (and remember, if you order more than $25 you’ll get the FREE Time Flies anniversary pin!). Another new project I’m happy to announce is my PERPETUAL CALENDAR – an enormous project consisting of a perpetual calendar with 60+ tiles (including special event tiles for birthdays, seasons, etc. with my paintings on them) and 12 handpainted figurines – all on a specially-built calendar shelf. Perpetual calendars can be used year after year, as you arrange the days of the week, holidays & date yourself with the tiles – super neat. It is in the pre-order stage so it is currently first available to USA customers at the Bradford Exchange – you can order here. Live outside the US? Don’t worry, after the release it will pop up at the international shipping site Burning Desires here later this year after the release for worldwide shipping anywhere on the globe. And finally – ACEOs! I have a bunch of new ACEO cards up for auction on eBay, each starting at literally one penny, each one will be popping up a different day this week while I’m out of town click here to see them all…… I will be back home in time to ship these out with no delay. Jasmine’s at Disney & MegaCon! 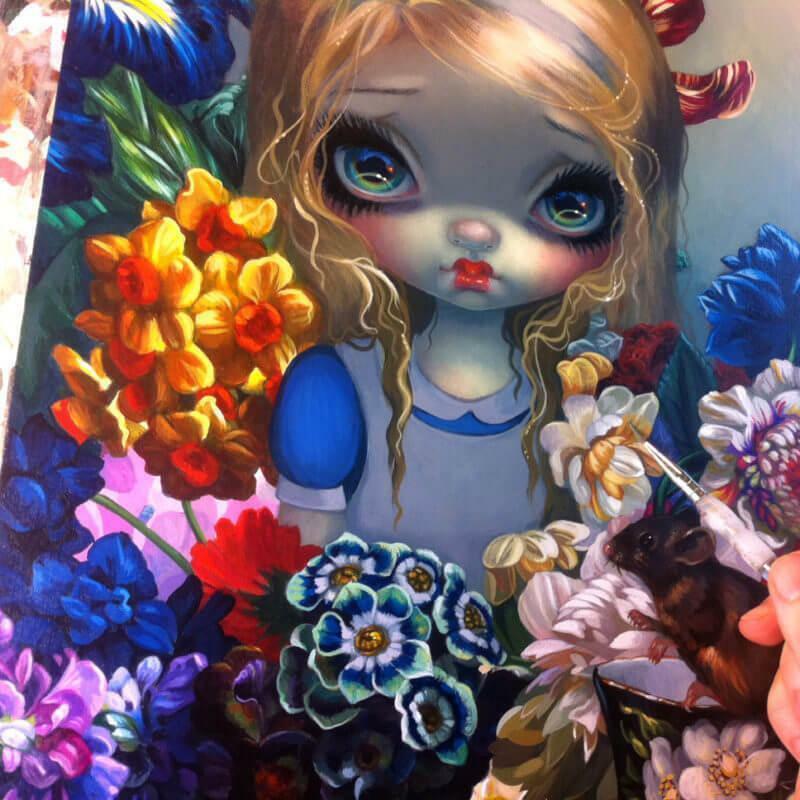 New Pins, new Alice paintings, Minis & more! I have been a busy girl the past couple of weeks, so I have an enormous update! Firstly – I have TWO upcoming events here in Florida this coming week! Saturday May 20 I will be at Disney Springs – Marketplace Co-Op from 4-7pm. And then starting Thursday I will be at MegaCon (all four days!) in May 25-28th also. Details on events are here, more news below. We have just released our “May Pin of the Month” – Moth Queen! Moth Queen & other Pins are HERE. Metal & enamel, these turned out GORGEOUS and are only $12.99 and can be shipped worldwide. The Limited Edition pins are selling fast but we still have some left – go grab one while you can! Nextly – I have several new paintings! The first (yes, she is wearing glasses!!) is a custom Faces of Faery with sea turtles (and did I mention she’s wearing glasses?) – we have prints & canvases on sale of her this week from $9.99 here! The next new painting is “Alice and the Fawn” – an illustration for my upcoming Alice in Wonderland Oracle Deck. The original has sold but we have prints & canvases of her here. The third new original painting is actually one of my framed MINI paintings – 3×4″ original acrylic painting on panel, framed in a frame made by my husband Matt, only $495 buy-it-now here on eBay – “Distracted by Stars”! 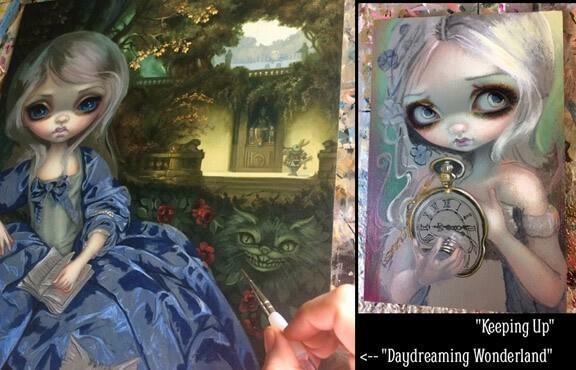 Speaking of original paintings, I will be debuting “Alligator Girl” and “Daydreaming Wonderland” at MegaCon, along with some new mini paintings! Check out my Instagram (ID: Strangeling) or Facebook here to see these works-in-progress. One of my favourite paintings- “Three Little Birds” is this week’s sale print! Only $9.99 for prints, open edition canvases only $90 this week here. We have another “Last Chance” Limited Edition Canvas up on eBay – the final #25 of 25 hand embellished signed & numbered (#25 of course) of this now-sold-out edition. No more will be made – it is for “Delusions of Grandeur” and you can bid on her here. We are also running low on “Butterflies and Bones” (the last one before the final one is for sale here), as well as “Alice in the Garden of Earthly Delights”here and “Alice with the Dormouse” here. Works-in-progress! Stay tuned at Instagram (Strangeling) and Facebook for daily updates! Jasmine’s at Pop Gallery tomorrow! 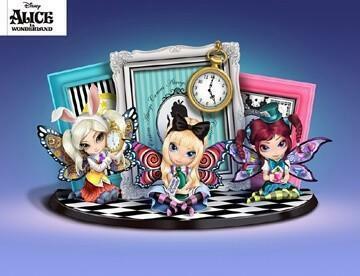 Naka-Kon, Vinylmation Dolls, Disney, “The Offering I”, Vermeer & more….. Thank you all who came to see me in California – had an AMAZING show. If you missed me, don’t worry – I’ll be back for a huge Take Over event in October (27-29th three full days, I’ll be able to see everybody then!). 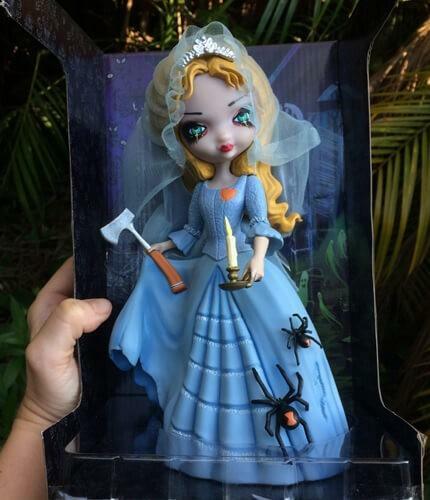 The new Haunted Mansion Vinylmation doll was sure a hit! She has popped up for sale also now with worldwide shipping here at YourWDWStore (click here and scroll down near the bottom). Soon she’ll also be re-stocked too at DisneyStore.com along with the new “Ariel” and “The Bride Returns” prints & canvases, etc. I’ll let you all know when they pop up, in the meantime you can find them all at Disney’s WonderGround Galleries. Tomorrow – I will be at “our” Disney Springs Saturday March 11 (tomorrow) at the Pop Gallery from 6-9pm! We are launching my new Creativity Journal and I’ll have tons of other artwork there too. Why not come early to Disney Springs and also hit the WonderGround Gallery at the Co-Op, get some new Disney stuff, bring it by Pop Gallery and I can sign those too while you’re at it! Again, tomorrow I’m at POP GALLERY – details here. (Also on April 15 I’ll be at our Florida WonderGround Gallery at the Co-Op again too, in case you miss out tomorrow!). One of my favourite paintings- “Loup-Garou: Blanche Neige” is this week’s sale print! Only $9.99 for prints, open edition canvases only $90 this week here! New skins & cases & decals for phones, video games & other devices are now available from DecalGirl – check those out here! Jasmine at Epcot, “Soft Shell” painting, new Strangeling Amazon store, Video & giveaway! In other event news, Epcot International Festival Of The Arts has begun! You can find my artwork at both the Pop Gallery Tent and the WonderGround Gallery Tent (both over by the Canada pavilion). I will be there in person for seven different dates starting this Monday the 16th – basically I’ll be either at the Pop Gallery tent (with my personal artwork) on some nights and then at the WonderGround Gallery tent (with my Disney character art) on other days. Click here for event details, I will be there in person on January 16, January 20, January 21, February 10, February 11, February 17 and February 18th. Even when I am not there in person, my artwork will be! Speaking of prints and canvases – I am pleased to announce that we are now also on AMAZON. You can see the Strangeling store on Amazon Handmade right here – huge selection of my open edition prints & canvases, but on Amazon for those of you Amazon junkies or for those of you who like to use their gift cards, rack up cc points, or just like the ease of ordering through them. And in other exciting news – I have a new video on YouTube here showing a complete start-to-finish (from priming a panel to sketching to finishing!) timelapse of my new Tiny Treasure painting. And guess what? I’m GIVING AWAY the original painting as part of my monthly Patreon giveaway. All of my Patreon supporters will be entered automatically, if you are not yet a member you can sign up here by clicking “become a patron” – just $1 gets you entered into all the contests, etc. and other tiers have fantastic other rewards and other behind-the-scenes previews, etc. The giveaway will be this Tuesday at 8pm EST, as long as you sign up by then you will be entered. 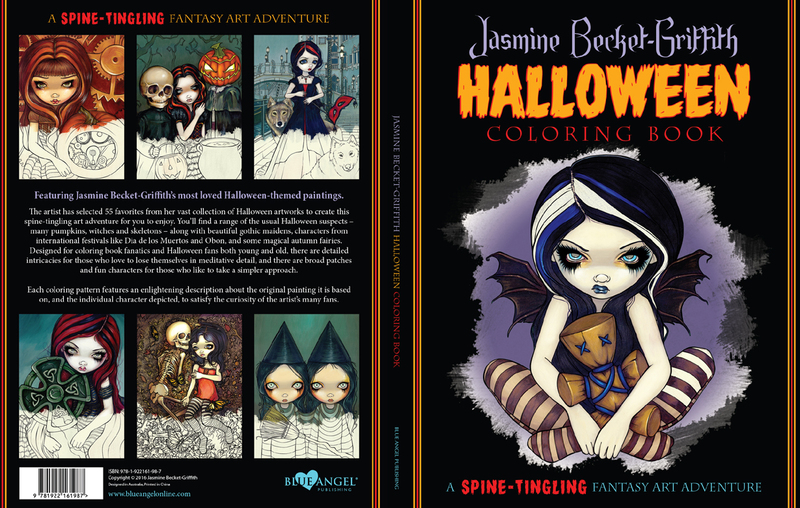 Jasmine’s Halloween Coloring Book, upcoming shows, Faerytale Oracle & More! I have been SO busy lately, and thus have a lot of exciting stuff to share today! Firstly – I have a TON of upcoming shows. This weekend I have two events – this Saturday(the 21st) I’ll be in person at Disney’s Marketplace Co-Op at Disney Springs here in Florida from 4-8pm – details are here. Also this weekend in Kansas City I’ll have a booth at Planet ComiCon in the Vendors Area (booth #1225, May 20, 21, 22nd) with tons of artwork, books, merchandise, etc. – I myself will of course be in Florida doing my Disney show at this time, but my sister Amber will be running my booth details here. 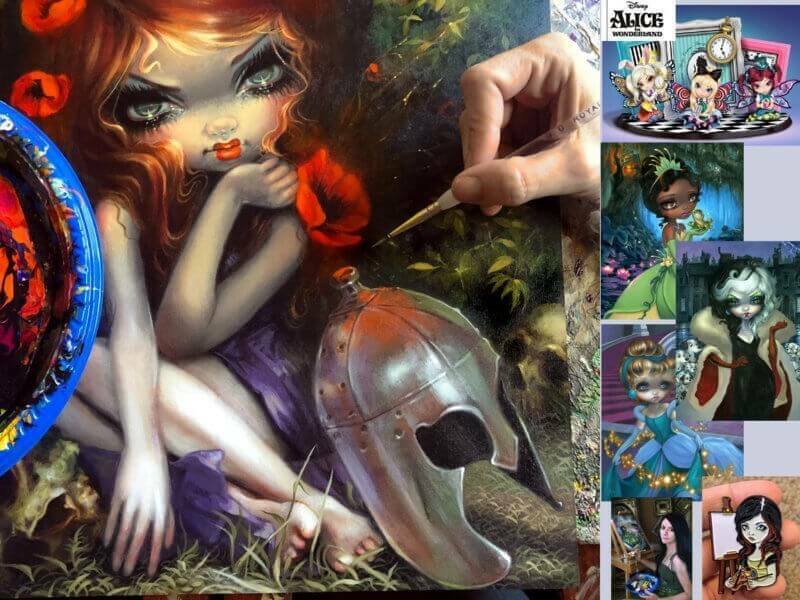 Next weekend, May 28 at Disney Springs but this time at Pop Gallery I will be having a launch party event for my Faerytale Oracle Deck – details are here (I’ll be there in person from 6-9pm). 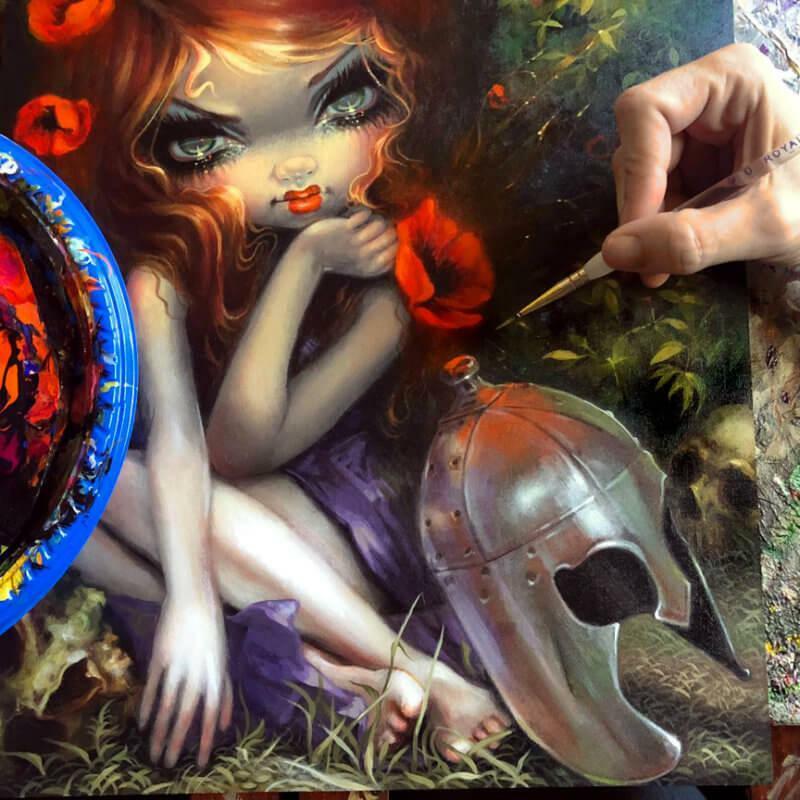 And then on June 3rd in Albuquerque, New Mexico I will be at Stranger Factory debuting some new paintings & prints, I’ll be at the gallery from around 6-9pm, details are here. And no – I will sadly not be at MegaCon since they changed the dates they ended up interfering with all my other shows I already had scheduled. I will return to MegaCon in 2017 though! Secondly – My HALLOWEEN COLORING BOOK. Yes, you can pre-order now! Out in September, you can pre-order an autographed copy directly from me and I’ll ship ANYWHERE in the world – click here to order an autographed copy. Want it cheaper but don’t need it autographed? It’s popped up to at the USA Amazon website here. You can also order (from some countries) at Llewellyn here. Soon it will be on all book selling sites and bookstores worldwide. This book is awesome! Fifthly – One Fantastic Workshop! I’m teaching my first workshop this November 17-20th (all details are here) at “One Fantastic Workshop” in Nashville! They are now accepting installment payment plans for students with a May 31 deadline (Sept 21 for full payment). It’s going to be – fantastic! Myself, Stephanie Law, Samuel Flegal, Peter Mohrbacher Ron & Vanessa Lehman, Kelly McKernan Cavanah, Sean Murray & more will be instructors. Room & board included, hands-on painting workshops, lectures & discussions on art, art business, networking, licensing, all things art and art-industry related – all skill levels are welcome. Details are at the link above and also on my own event page I made for it here – there are a LIMITED number of spots for students, so signing up sooner rather than later would be a good idea. And finally – I’ve been working hard on a lot of new paintings. New Disney pieces for my Disneyland show this summer, and new originals for my solo show at the Corey Helford Gallery in July as well. 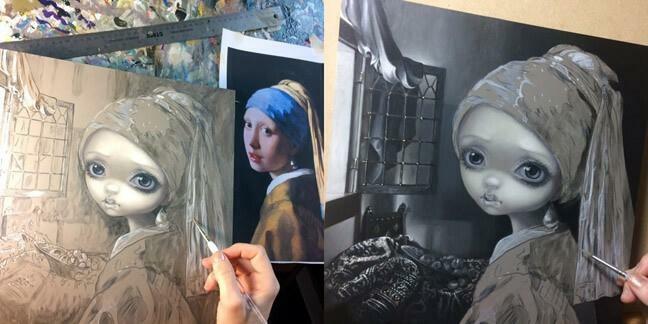 Be sure to follow me on Instagram – (ID: Strangeling ) – to get daily updates on my works in progress! You can see some if you scroll down through this update. It’s my HALLOWEEN COLORING BOOK. Absolutely gorgeous, same format & publishers as my first coloring book. This one however is comprised of my Halloween paintings – fun & spooky! Traditional Halloween witches, pumpkins, autumn fairies, vampires, werewolves, trick-or-treating, gothic finery, candy corn, black cats & more – everything I love about the Halloween season. 96 pages thick, 55 different pictures in all. Out in September, you can pre-order an autographed copy directly from me and I’ll ship ANYWHERE in the world – click here to order an autographed copy. Want it cheaper but don’t need it autographed? It’s popped up to at the USA Amazon website here. You can also order (from some countries) at Llewellyn here. Soon it will be on all book selling sites and bookstores worldwide. Don’t have my first coloring book? You can order the first book from the publishers here WORLDWIDE or still get autographed copies of the first book shipped WORLDWIDE from Strangeling.com here. Also at Amazon, Barnes & Noble, Books a Million, etc. Been very busy this past week! We’re getting ready to head out for the Kansas City Renaissance Festival (Details are HERE). I will be there IN PERSON this weekend (September 26-27) and the following weekend (October 3-4) and weather permitting, I’ll be PAINTING at my easel out front! Building 251, kinda by the Joust. This weekend is Steampunk themed, so if you come by this weekend wearing steampunk inspired finery/accessories show them to us and you can pick out a FREE 4×6 print! I’ve been painting up a storm! All of the pieces I’m currently working on are destined for my Birds and Beasties solo show opening in Seattle’s Eight and Sand Gallery on October 10th (I’ll be there! Details are here). I’ve posted some work-in-progress photos later down in this update. (Members in the 50+ subscription of my Patreon page here can preview the fully finished framed paintings before the show opens, click here for details). I have new ACEO cards up for auction! I only make one of each, and I always start the bidding at just one penny each up at eBay to give everybody a chance. ClickHERE to see them all. In other news, I’m giving away an autographed copy of my “Beautiful Creatures” Tarot set this Sunday night, picking a random Patreon patron that evening. Details below further down in this update, or on my Patreon feed here. Jasmine’s 1st Coloring Book! Unseelie Court Greed, 20 Sided Dice Fairy & more…. We are BACK from Dragon*Con – thank you all who made came to see me & helped make it our best, most successful and BUSIEST Dragon*Con ever. We’ll be back next year! Kansas City folks! The KC Renfest hast started! Details are on my event page here . My permanent gallery will be open every day at the Renfest for the entire season, and I myself will be there in person the last week of September and the first week of October (and I’ll be painting!). Now onto the BIG news! Yes, I’m officially announcing my first coloring book! 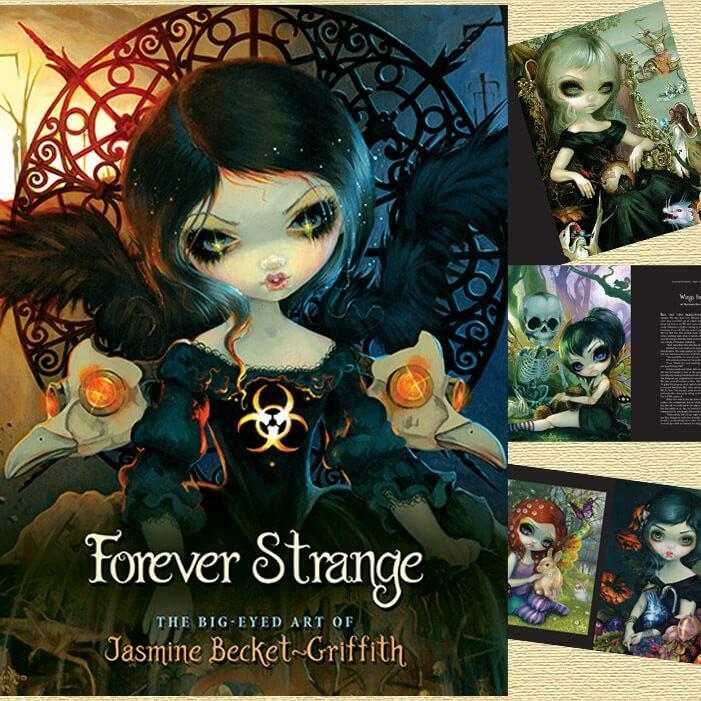 TheJasmine Becket-Griffith Coloring Book is being published by Blue Angel Publishing (the folks who did my Strangeling book and many of my Oracle Card Decks). I do not yet have a release date or price, but stay tuned- it’s a big fancy coloring book great for grownups (or kids of all ages too) and will be available worldwide, on Amazon, etc. Now for the new art! I debuted a lot of new original paintings at DragonCon, and we’ve started releasing all of them now online as prints (pretty much all of the originals however are sold). 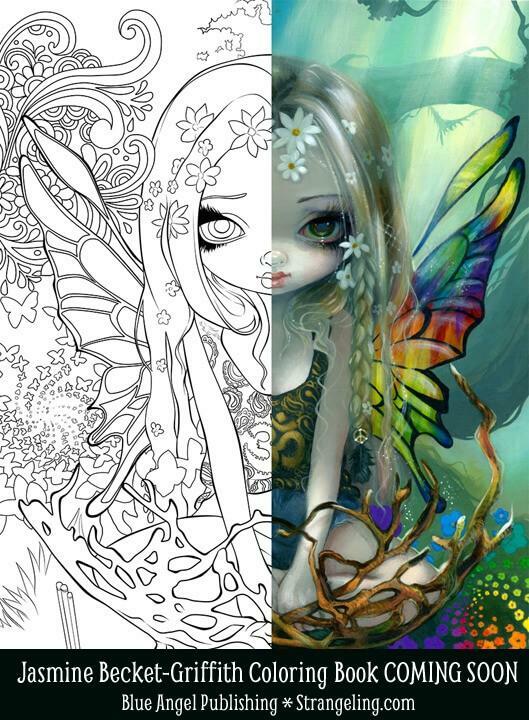 Today I’m introducing “Unseelie Court: Greed” and “20 Sided Dice Fairy“!